We see a car drive across a field, out in the middle of nowhere. The car stops, and two men get out, one in military uniform and one in a suit. 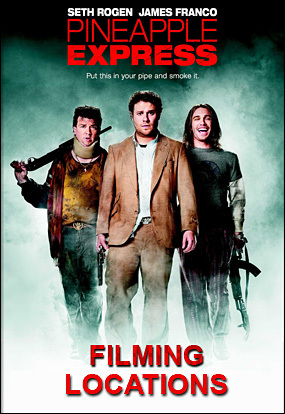 They lift up a fake rock and climb down into a chamber hidden below ground, where an experiment (testing the effects of pot) is being conducted in a secret government lab. This outdoor scene was shot at the former Ahmanson Ranch movie ranch, which is now a public nature preserve known as the Upper Las Virgenes Canyon Open Space Preserve. As Ahmanson Ranch (part of which is also known as "Lasky Mesa"), the land appeared in many movies, most notably "Gone with the Wind" - in the scene where Scarlett vows never to go hungry again. To get there, take the 101 Freeway west to Las Virgenes road, then head north to where it dead-ends at the park entrance. As you'll see later, the same location was used for a few more scenes in this movie. On the other hand, once they get below ground, into the secret government lab, the location shifts 40 miles to the south, to a former newspaper office: that of the South Bay Daily Breeze, which was located at 5215 Torrance Blvd, in Torrance. That's on the north side of Torrance Blvd, where Palos Verdes Blvd ends, about midway between the Del Amo mall and the Redondo Beach Pier. The newspaper moved to new digs in Torrance (and the building will reportedly soon be torn down to make way for a hospital office building), but while the old newspaper building was sitting there empty, the Pineapple Express producers rented out the empty press room and used its space to create the lab you see in the photo above (as well as two other locations we'll get to later). We then see 'Dale Denton' (Seth Rogen), a process server, driving around town, serving people with subpoenas. One of the places we see, as he drives past, is a distinctive McDonald's (see the photo above). That happens to be the world's oldest McDonald's. It was created by the original McDonald brothers in 1953, and features a 60-foot-high, old-fashioned neon sign with "Speedee the Chef". At the school, he meets some of her friends in the hallway (they make him feel insecure), and a teacher who obviously doesn't approve of his relationship with Angie. That school is really University High School, located at 11800 Texas Avenue, in West Los Angeles. That's less than a mile west of the 405 Freeway, a block south of Wilshire Blvd, at the northwest corner of Texas & Westgate Aves. Dale goes to the apartment of his dealer, 'Saul', to buy some grass, and Saul sells him a new special variety called "Pineapple Express". The two smoke a joint together, before Dale hits the road again. Dale then goes to the home of 'Ted Jones' (Gary Cole) to serve a subpoena. Unfortunately, unknown to Dale, Ted turns out to be a murderous drug boss - the same guy that sells the pot to Dale's dealer's dealer ('Red'). While Dale is parked outside Ted's house (smoking again), he is horrified to witness Jones and a female cop (Rosie Perez) shoot an Asian man to death in the front upstairs window. In a panic to escape, Dale throws his joint out his car window and speeds away. But Ted Jones finds the joint, recognizes his own unique variety of grass, and goes looking for whoever was parked outside his house. You'll find Ted's house at 1845 Niodrara Drive, in the hills above Glendale, CA. That's west of the Glendale (2) Freeway, on the west side of Niodrara Dr, between Fembrook Place & Hillside Drive. It's actually a landmark home, built in 1941 by architect R.M. Schindler, it is known as "The Rodriguez House". or do anything else that might disturb the residents. After witnessing the murder, Seth rushes back to Saul's place in a panic, to tell him what he saw. While there, Saul tells Seth that Red (his supplier) gave him an "exclusive" on "Pineapple Express" - that he was the only person in town who had the unique grass. Seth realizes that this could allow Ted Jones to track them down and kill them. In a panic, they flee the apartment. You'll find Saul's brownstone apartment house at 118 N. Westmoreland Ave., in Los Angeles. That's on the east side of Westmoreland Ave, across from Virgil Middle School. That's just south of the Hollywood (101) Freeway, just north of W. 1st St., and just west of N. Virgil Ave.
Not knowing where to go for help (fearing that the cops may be in on it), Dale & Saul flee to the woods, where they smoke by a creek, try to get a caterpillar stoned, destroy their cell phones, and go completely paranoid once it gets dark - before eventually waking up the next morning to find their car's battery is dead. These outdoor scenes were almost certainly shot in the valley oak & willow woods that run along the Las Virgenes Creek, back at Ahmanson Ranch (AKA the Upper Las Virgenes Canyon Open Space Preserve) in Agoura Hills (where they filmed the opening scene). Dale & Saul hitchhike back to civilization (on the back of a towed boat), and head over to Red's house. Red (Danny McBride) is the dealer who sold the "Pineapple Express" to Saul in the first place. The guys want to find out if Ted Jones has been asking about them (he has), and if so, to warn Red not to tell Jones anything (knowing Ted will kill them if he finds out who was smoking it outside his house). But it's too late. Red has already been visited by Jones's thugs, and has told them everything. When Dale & Saul show up, Red lies to them, and then tries to phone the thugs to let them know the guys have shown up at his house. Dale gets suspicious, and a crazy fight ensues between the three, resulting in them subduing Red and duct-taping him to a chair, where he confesses the truth. Soon, Ted Jones's thugs show up at the door. Red tells Dale & Saul to go out the back exit to safety, but Red then immediately rats them out to the thugs. The thugs later shoot Red in his living room - while he's still duct-taped to the chair - and leave him for dead (which turns out to be a mistake on their part). You'll find Red's house at 2817 Dalton Ave, in Los Angeles. That's in the Adams district of L.A., west of the 110 Freeway, and south of the 10 Freeway, between Western & Normandie. It's on the north side of Dalton, three houses east of W. 29th St. The guys run for their lives, out the back door of Red's house, then down an alleyway, where Saul jumps into a dumpster and briefly refuses to come out. ("Why?" "Because I'm already in the dumpster!"). Dale talks him out of the dumpster and they continue running away down the local residential streets. Some actual locations don't match the sequence seen in the film, but in this case, that alley really is right behind (just west of) Red's house. It's a narrow alley (blocked off at the south end) which runs north/south between the homes on Dalton Ave and N. La Salle Ave, just north of W. 29th St. They head south down the alley. In the photo below, the guys are still running away from Red's. The camera is looking south down N. La Salle Avenue, from 29th Street. The guys are running west on W. 29th St.
That's just about 100 yards southwest of Red's house.